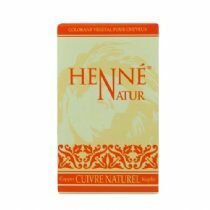 The Henné Color Conditioning balm made with henna is used as a conditioner. Enriched in natural organic henna extract, it helps style your hair. Henna has a strengthening, antiseptic, antiseborrheic effect. This is a plant-based conditioner; it brings softness, suppleness, shine and volume to your hair. It helps style your hair by fixing onto the hair fibre, and is free from silicone, SLSs, and parabens. Excellent to use with all henna powders and creams.